Les Moss was introduced to sports page readers as the “greatest find in professional baseball,” according to his enthusiastic manager Jerry Tiemann, skipper of the Americus Pioneers in the Class D Georgia-Florida League. Moss was 17 years old at the time. He’d been signed by St. Louis Browns scout Jack Fournier in October 1941, when he was 16, and optioned to Americus. The two Moss boys had a sister, Elaine. William Moss played a bit of baseball himself, and Perry recalls his uniform for the Oklahoma Iron Works team. “He influenced both of us athletically.” Les and Perry were just 16 months apart in age, and Perry says they frequently played baseball together “on little sandlots teams. He was just a great hitter. I was a pretty good baseball player, but I couldn’t hit like he could so I turned to football.” Perry Moss went on to a 50-year career in football. He played for the University of Tulsa in the 1945 Orange Bowl and then in Big Ten football for Illinois in the 1947 Rose Bowl. Perry played pro ball for a year, and then went on to build an impressive resume in coaching, including stints as head coach at Florida State, Kentucky, LSU, and more, as well as the CFL Montreal Alouettes and his last 10 years in arena football. He is in the Florida Sports Hall of Fame. Les’s formal education began with nine years attending the Longfellow School in Tulsa, and then three years of high school at Tulsa Central. He never played sports in high school, but both Les and Perry were batboys with the Tulsa Oilers. “We were batboys for all the foreign teams that came in” is how Perry puts it. He recalls when the Yankees came to Tulsa, with an ailing Lou Gehrig on the team. After reporting to spring training in Mayfield, Kentucky, in 1942, Moss was placed with the Americus Pioneers, a Cubs affiliate. Such arrangements were reasonably common at the time. In 1943 he caught for the Class A Elmira Pioneers, the Eastern League team of the Philadelphia Athletics – but he was still signed to a Browns contract. He’d hit well at a time when not much offense was expected from catchers, batting .299 for Americus and .308 at the higher classification with Elmira. He missed the 1944 and 1945 seasons while serving in the Merchant Marine. Les worked as an oiler on board ship, and served in both the Pacific and European theaters, including work in the Atlantic at the time of D-Day. In 1946 the Browns assigned him to their own farm team, the Toledo Mud Hens, in its first year of Triple-A status in the American Association. That’s where he met his first wife, Yvonne Kelentic. Moss was hitting .297, but with sudden power (13 home runs in 121 games) when he was called up to the big leagues in September. He was a stocky 5-feet-11, weighing 205 pounds. Moss started the September 10 game against the Athletics at Sportsman’s Park, catching Cliff Fannin, and was 0-for-3 at the plate, though he did “drive in” a run when relief pitcher Russ Christopher walked three batters before him and then hit Moss with a pitch. He collected his first hits, a single and a double, on the 12th, driving in another run. On the 15th, he came to bat with the bases loaded and two outs in the bottom of the ninth with the game a 1-1 tie against the visiting New York Yankees, and the right-handed batter singled down the first-base line, driving in the run that won the game. He had a nice start, appearing in 12 September games and finishing with a .371 average. He was back with the Browns in 1947 and didn’t return to the minors until he finished 13 years as a big-league catcher. His first full year, however, saw his batting fall through the floor – he hit for a dismal .157 average, though he did collect his first six homers and drive in 27 runs, getting a little more work than left-handed hitting catcher Jake Early. Les was more selective as a hitter in 1949, walking 49 times and striking out only 32. For whatever reason, it was the only season in which his bases on balls significantly out-numbered his strikeouts. The plate discipline helped him achieve a .291 batting average and a career-best .399 on-base percentage. Though he saw Sherm Lollar get more playing time, he still got into 97 games. His last full season with the Browns was 1950. His average declined to .266, still quite good, but Lollar had better numbers and deservedly got the lion’s share of the work. After a slow start in 1951, batting just .170 by mid-May, Moss was traded to the Boston Red Sox in a deal that today seems almost unaccountable. They sent St. Louis four things: catcher Matt Batts, pitcher Jim Suchecki, a check for $100,000, and (two months later) pitcher Jim McDonald. All that to acquire Moss, who hit .198 for Boston. Why did the Red Sox make the trade? They lacked a catcher they had confidence in, though they had several who were just as serviceable as Moss. But, wrote Ed Rumill, they must have been “impressed, no doubt, by the occasional balls Les has hit against and over the high left field wall at Fenway Park.” [iv] He had hit seven of his 38 homers at Fenway. And in his second game for the ’51 Red Sox, he hit one off Bob Feller. Three days later, he hit a grand slam – his first—off Ted Gray of the Tigers, who lost the game 6-3. The year wasn’t even over before Moss was sent back to the Browns as Boston traded him and Tom Wright to St. Louis for catcher Gus Niarhos and outfielder Ken Wood on November 28. Niarhos had only been acquired the day before, in a deal St. Louis made with the White Sox. Moss played both of the next two seasons for the Browns as a backup backstop to Clint Courtney. He hit .246 and .276, then went with the team as the franchise moved to Baltimore to become the Orioles, where he hit .246 again in 1954. He suffered stomach disorders in spring training, which he attributed to something he’d picked up while playing winter ball in Mexico. He was underweight and also diagnosed with a form of diabetes. (His .246 averages in 1952 and 1954 were within one point of his career mark; when he hung up his spikes, and the tools of ignorance, after a couple of games in 1958, his career batting average was .247.) 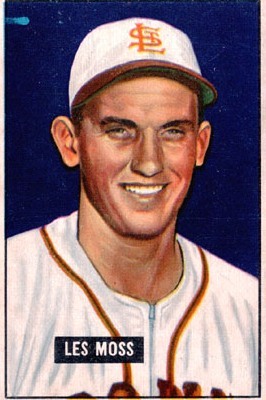 Courtney was still the main man for the Orioles in ’54. On September 24, Moss lost his wife Yvonne, a passenger in a car struck by a truck at an unmarked intersection in Toledo, leaving Les with their daughter Sandra, six years old at the time. He was remarried on February 4, 1956, to Carol Jean Gigandet. His brother Perry served as his best man. The 1955 campaign saw him working behind a new catcher, Hal Smith, mostly coming late into games or as a pinch hitter. He was hitting well when given the opportunity--.339 in 56 at-bats—and the White Sox felt they needed a third catcher so decided to take a chance on Moss, sending Harry Dorish to the Orioles on June 6. It was more of the same for the White Sox, occasional appearances and serving as backup again to his former Browns teammate Sherm Lollar. Moss started well, but tailed off to hitting .254 for Chicago. It was Lollar, backed by Moss, for two more years – 1956 and 1957 – with averages of .244 and .270. Early in 1958, he was with his wife and daughter in their 14-foot fiberglass boat when the outboard motor conked out and the three of them went adrift for 22 hours, carried some 30 to 40 miles in the Gulf Stream before being spotted and rescued. He was with the team all season as the number three catcher, but only appeared in two games – for one at-bat on June 22 (he popped up to first base, which ended the game) and another plate appearance on September 1 (he walked to load the bases, and was replaced by a pinch runner, who later scored). The White Sox lost both games. In 1959, he signed again with the White Sox prompting some wag at the Chicago Tribune to headline the brief news bit, “SOX BREATHE EASIER; MOSS SIGNS FOR ’59.” [v] He was assigned to catch for the Indianapolis Indians, Chicago’s Triple A club, and hit .223 in 94 at-bats. In 1959, he didn’t get much more work than in 1958; in three at-bats for the San Diego Padres in 1960, he singled once but a back injury prevented him from running or throwing effectively. After both seasons he managed teammate Luis Aparicio’s Maracaibo Rapiños in the Venezuelan winter league. But after 1,196 games as a professional, his playing career was complete. Moss worked with the White Sox in 1960 as bullpen catcher from May 1 until he suffered a broken bone in his left wrist on June 5. He worked as a scout both in 1960 and 1961, and again in 1965. In between, in 1962 and 1963 he managed in the South Atlantic League. He was handed the reins of the Savannah White Sox and started the ’62 season there. After the wives of players Deacon Jones and Don Buford—two black women—defied Georgia custom by sitting in a whites-only section of the grandstand, the franchise moved to Lynchburg, Virginia, on August 26. Despite the upheaval, Moss’s Savannah/Lynchburg White Sox won the pennant. In 1963, Lynchburg finished tied for second, just two games out of first, and Moss was named the Sally League manager of the year. In 1964 he returned to Indianapolis, this time to manage the Indians to a second-place finish. In 1967 Moss started a new career, as a coach for the White Sox for four years, through 1970 and through several confused White Sox seasons which saw five managers in 1968 alone. Moss himself succeeded Eddie Stanky as interim manager for two games, then gave way to Al Lopez. But Lopez had an appendectomy and developed an infection, so Moss filled in for another 34 games before El Senor returned for his second stint. Moss served as White Sox pitching coach in 1970, but resigned at the end of the season and left the employ of the White Sox after 16 years. In February 1971, Moss was hired by the California Angels to manage their Shreveport club, the Captains, in the Double A Dixie Association. He stayed with the Angels two more years, both in the Pacific Coast League as skipper of the Salt Lake City Angels. In 1974, he scouted for the Angels. The Tigers had Moss succeed Jim Leyland as manager of the Montgomery Rebels in 1975 and 1976. In both years, Montgomery won the Southern League championship, both times beating Orlando. In 1977 and 1978, Moss managed the Evansville Triplets, also for Detroit. After the 1978 season, Moss was voted Manager of the Year in the American Association, and The Sporting News named him Minor League Manager of the Year. Moss got a new job in July as the Chicago Cubs’ minor-league pitching instructor for the rest of 1979 and 1980, also serving as manager of the Midlands Cubs in 1980. He was pitching coach for the Chicago Cubs in 1981. When replaced, he was offered another position with the team, but declined and took a job as minor league pitching instructor with the Houston Astros instead. It was likely a very good decision. He served as a major-league coach for the Houston Astros for the next eight years, from 1982 through 1989. Most managers will bring in their own coaching staff, but Moss must have had the goods. During that stretch, he served under successive skippers Bill Virdon, Bob Lillis, Hal Lanier, and Art Howe. After one final season with Houston, again as minor-league pitching instructor, Moss went on to do work as pitching coordinator for the San Francisco Giants starting in 1991. His brother Perry explained, “He would go to training camp in the spring and then he had a motor home and went up to someplace around Seattle and then to Davenport, Iowa. Then he went to Shreveport. He’d make that trip about two times a year and then come home. One day up in Seattle, he got up and said, ‘Guys, we’ve had enough of this’ and he went home and he didn’t work any more.” It was 1995. Les Moss had finally retired after half a century in baseball. In early 2010, the 84-year-old Moss was bedridden, having suffered hip replacement surgery and a fall that had brought about bleeding on the brain. He died in Longwood, Florida, on August 29, 2012. Interview with Perry Moss on February 15, 2010. Thanks for assistance to Maxwell Kates, Rod Nelson, Tom Ruane, and Jim Sandoval. [i] All quotations are from the Perry Moss interview, unless otherwise indicated. See also Atlanta Constitution, May 29, 1942. [ii] E-mail communication from Royse Parr, February 18, 2010. [viii] Unattributed Associated Press clippings in Moss’s Hall of Fame player file. [x] Unattributed clipping found in Moss’s Hall of Fame player file.